When President Barack Obama visits Delhi for the Republic Day celebrations, climate change—a bugbear in the US-India relationship—is expected to be high on the agenda. The US president, heady from his dramatic breakthrough in brokering a climate deal with the Chinese, is hoping to get something from India now. What then is the likely outcome of the talks? What should India do? Let me try and set out two scenarios—one that is pragmatic and will suit the bilateral bonhomie but will be bad for the world’s fight against catastrophic climate change; the second option, required for real and meaningful emission reductions in an increasingly heated world, which is less likely but needed more. The first option is that the India-US deal on climate change will be based on the mutually accommodative arrangement of the China-US deal. In the case of China, the US has agreed that both countries will “equalise” emissions by 2030. In other words, China will be allowed to increase carbon dioxide emissions till 2030 so that it can reach the same level as the US. In turn, the US will reduce its emissions by 26 to 28 per cent over its 2005 levels—when it had peaked—by 2025. This is all, Barack Obama has made clear, he can do using his current presidential powers and without having to go back to his recalcitrant Congress. In this way, the Chinese, go from roughly 8 tonnes per capita of carbon dioxide emissions today to 12-13 tonnes per capita in 2030. The US comes down from 17 tonnes per capita of carbon dioxide emissions to 12-13 tonnes in 2030. In fact, the cake is carved up in such a manner that each country would occupy equal atmospheric space by 2030. The US-China deal makes it clear that both the countries individually get 16 per cent of the atmospheric space by 2030. This will leave little space for the rest of the world to use for their growth. It is also important that at this rate of emissions, there is no way the world can stay below the guardrail of 2°C rise in temperature, which will keep the world safe. So, the deal is not sustainable. It is not equitable. But it is mutually convenient. In this backdrop, what will the India-US deal look like? India’s current per capita emissions are roughly 1.8 tonnes of carbon dioxide. Our emissions between 1850 and now add up to a measly 50 billion tonnes, against 400 billion tonnes of the US. And so, even though we are being touted as being the world’s third largest polluter, in reality, we are a small speck in the polluted atmosphere. Nothing more. In this case, if India also asks to equalise emissions with the US and China, it would mean that it has a long way to go. So, I believe, the India-US deal will also be a convenient compromise. 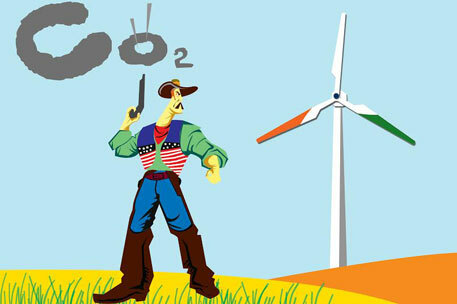 The US is fully aware that it cannot ask India to put forward a “peaking” year for its emissions. This is because, if India uses the same principle, as China and the US, it will peak its emissions anytime between 2050 and 2060 and will need to increase emissions to catch up and equalise with the two big players. So, the agreement will be to focus on the targets for increase of renewable energy like solar and wind. India, in its national climate action plan, has already stated that its goal is to ensure that 15 per cent electricity comes from renewable (non-hydro) by 2020. This could be increased, given that the new government has already announced that it plans a big solar energy future for the country – upping targets from 20 GW to 100 GW by 2022. In addition, India has also agreed to cut emissions intensity by 25 per cent by 2020. The agreement is likely to call for further improvement of this target. All this is important and clearly it would serve India well to invest heavily in renewable technologies and efficiency of production. It is also clear that there is huge energy poverty in our country. Over 700 million households still use inefficient, polluting biomass to cook food; millions do not even have access to electricity. This is not acceptable. It is important we have a strategy to meet the energy needs of all and there is also no doubt that renewable energy can play a critical role in this, particularly if we invest in decentralised generation. But we should also be clear that this transition to renewable energy carries a cost and is not easy. No country, other than Germany, and certainly not the US, has achieved this goal. In fact, with sliding prices of oil and gas, renewable investment is down and not up in the world. So, what then is the second (not so practical or possible) option for the India-US deal on climate change? This would be an agreement to live within the planetary boundaries—agree that the world needs to cut emissions drastically and urgently so that the 2°C rise in temperature guardrail is not breached. This would mean that all countries, including India, agree to cut emissions, based on their past contributions so that all countries can share the common atmospheric space. It would mean doing more, and much more to keep the world safe. So, let us be clear when US commentators—like the powerful Brookings Institute—call for “exception” to be made for India in climate change, they are looking to protect their country’s licence to pollute. It is not a favour to us that the US does not demand that we set a peaking year. It is the return gift that they want from us. Global warming is not climate change. Global warming is only one component of human induced part of climate change. The main and major factors that influence the local and regional issues are natural variation part of the climate change -- water resources availability and agriculture production. These are modified with ecological changes -- land use and land cover changes. This contributes to global temperature rise, though it contributes to local and regional issues and not global issues. pollution is an important component at local and regional level that not only affect the health of life forms but also water resources availability. The anthropogenic greenhouse gases versus global warming versus carbon credit policy only help sharing of billions of dollars -- COP20 meeting looked at it only. So, we must ask our government to give priority to controlling the pollution [air, water, soil & food] rather than worrying on anthropogenic greenhouse gases. To achie this government must change its policies on chemical input technology of agriculture including GMOs use; pollution in industry; urban pollution [air & water]. From herewith, I sincerely request Sunita Narain to re-look into CSE's agenda on climate change. The amount of money we may get from carbon credit policy is nowhere near to the losses from health hazards and destruction of water resources, etc related to pollution.